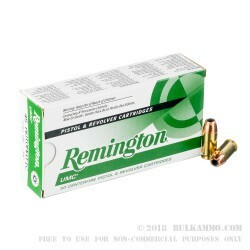 Remington UMC is a trusted line from a brand name that has been producing ammunition for ages. After that experience, you can trust they know a thing or two about making ammunition that is reliable and consistent. 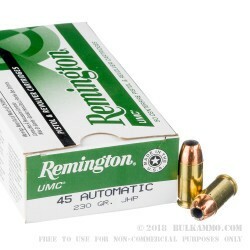 The pricing on the Remington UMC line is also competitive with some of the cheapest ammunition in the world and yet, offers hard to beat reliability and quality. 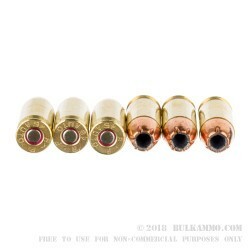 This is.45 ACP ammunition with a 230 grain jacketed hollow point projectile that is inside of a brass case with a Boxer primer and offers easy reloadability and features good reliability and consistent performance. Relatively cheap compared to other choices available for sale when it comes to personal defense ammunition, these rounds bring solid performance for the cost. The static ballistic numbers are as follows: 835 feet per second velocity and 356 ft. lbs. of energy at the muzzle. This isn’t ground breaking, but can substitute for a self defense firearm, or could be used for those who worry legitimately about over penetration or other safety concerns in a rural environment, for defensive purposes. 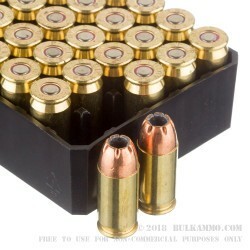 This ammunition is suitable for use in any .45 ACP firearm and this is a fine choice for all types of shooting from defense to range work.